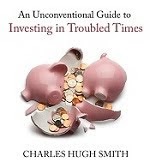 oftwominds-Charles Hugh Smith: Which Nations Will Crumble and Which Few Will Prosper in the Next 25 Years? What will separate the many nations that will crumble in the next 25 years and those few that will survive and even prosper while the status quo dissolves around them? As I explain in my recent book Pathfinding our Destiny: Preventing the Final Fall of Our Democratic Republic, the factors that will matter are not necessarily cultural or financial; being hard-working and wealthy won't be enough to save nations from coming apart at the seams. None of the current political systems are decentralized enough and adaptable enough to survive the non-linear era we're entering. As I explained in What If Politics Can't Fix What's Broken?, the politics of centralized compromise and incremental, top-down adjustments are wholly inadequate to dealing with non-linear disruptions. The problem, as we all know, is the parasitic elites rule the centralized hierarchies of wealth and political power, and they will cling to power even as the nation they rule crumbles around them. 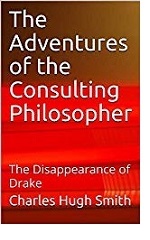 The hubris, complacency and greed of the ruling parasitic elites is near-infinite; the idea that the political and financial structures that they dominate will not survive simply doesn't exist in the parasitic elites, with the exception of a few outliers who are constructing remote bugout compounds with landing strips etc. Unfortunately for these outliers, they can't escape satellite and drone imagery, or the loose tongues of employees, contractors, etc. By the time the populace awakens to the precariousness of the entire status quo, it will be too late to effect meaningful change via removing the parasitic elites from power. Just as Rome was too hollowed out to survive by the end, the status quo structures will be too enfeebled to adapt quickly enough to survive. 3. Centralization of wealth, power and control has been the "solution" for hundreds or even thousands of years. 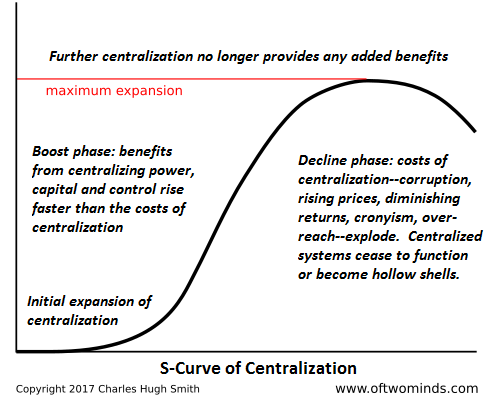 We're approaching Peak Centralization and the systemic failure of centralization as the "solution" to anything. The only sustainable solution going forward is radical decentralization of capital, political power and control of resources. The parasitic elites rule solely because wealth and power are so highly concentrated in the hands of the few. As the financial and political systems unravel and fail, solutions that are completely outside these centralized hierarchies will arise--if the populace is free to embrace them. 4. Solutions will obsolete the existing centralized financial and political structures. Reforms will all fail, as the parasitic elites will never relinquish their control or power. The "solution" will be the total collapse of the centralized financial and political structures and the parasitic elites that control them. 5. Adaptability and flexibility will be the core survival traits going forward. The only structures adaptable and flexible enough to respond quickly and effectively enough to survive are decentralized networks-- non-hierarchical, distributed rather than centralized, self-organizing rather than top-down. Few if any of the "leading citizens" of Rome anticipated its collapse 20 years prior to the implosion. That is as true of the parasitic elites now as it was then. Collapse is truly "impossible" in the current mindset; it isn't even conceivable that what works now will stop working. But complacent belief in the permanence of the status quo doesn't stop friction or rust, nor will it stop collapse. As an American, I hope the citizenry comes to understand the choice is simple and profound: either tolerate the dominance of our numerous parasitic elites and watch the nation come apart and fail or jettison the centralized structures the parasitic elites need to enforce their dominance. Thank you, Mike M. ($50), for your magnificently generous contribution to this site -- I am greatly honored by your steadfast support and readership. Thank you, John K.A. ($55.55), for your splendidly generous contribution to this site -- I am greatly honored by your steadfast support and readership.